20 years ago Stuart Roy Clarke started his footballing opus - The Homes of Football. As he states on his website and within several of his books he believed himself "to have a mission in telling the changing face of football, post Hillsborough." He believed he "was stood on the precipice of history, peculiarly privileged in (his) view, to witness a national institution in big trouble, reinventing itself." 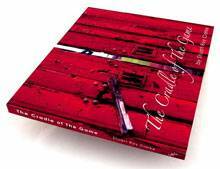 This Christmas I increased my collection of Clarke's work by asking for and receiving (I have been a good boy all year - after all) The Cradle of The Game. This pulls together 20 years of capturing the passion, the atmosphere, the rituals, the emotion, the game, at all levels from the Westmorland League to World Cups and European Championships. It is a vital and impressive piece of work that every football fan should own. You can buy it, along with his other books, here. Clarke's photography is so simple, yet so evocative to the senses you can hear the noise, feel the tension, taste the greasy burgers and feel yourself physically swerving around the river of urine pouring down the steps at Tynecastle in "Bogs Overspill". In the introduction to the The Cradle of The Game, Clarke states that he had "a real sense of mission to start telling the story anew. Club after club is facing dereliction, given the global recession combined with over-reaching oneself. Even though the game is ever more popular in footfall and some of the foot-ball is the best ever served. It’s just the sums that don’t add up." He is so right. The feelgood factor that followed Italia 90 elevated football to such a positive level in the public consciousness that the Sky input just added impetus to the new football bandwagon. At the same time the fans were finding a voice, particularly through the fanzine movement, and as football changed, the public perception changed, the money came in to the game and the fan experience changed, initially in positive ways. Now the fans are rising once more and the messages they are delivering are strikingly similar. Primarily fed up of being taken for granted, but also fed up of a game and players so far removed from the grim reality of everyday life in modern Britain. As a fellow Blades supporter put it to me the other day, when tweeting about the increasing demands and expectations of fans in this country, "£30+ a ticket, fans fleeced in club shop, players earning more per week than most people earn per annum. Money has made fans want it now." As the money poured into football, with little benefit filtering down to the fans, it has empowered supporters to be more demanding of their teams to an extent which is sometimes hard to reconcile expectation with achievements. The exchange of tweets followed news of Sunderland (7th in the Premier League) being booed off by their supporters after a home defeat to Blackpool and Cardiff City (2nd in the Championship) internet forums being filled with calls for Dave Jones to be sacked. I struggle to get my head around it. Where 45 quid gets you a restricted view seat at Stamford Bridge and £34 gets you the best seats for a match at Sheffield United or Leeds United. Yet, average ticket prices for the competitive Bundesliga in Germany cost on average 21 Euros. And still German fans are protesting at the increasing price. Where you have no choice but to sit and if you stand out of your seat for any prolonged period you are threatened with expulsion from the ground or arrest. Where it has taken intense fan pressure for safe standing to be considered by the authorities. Yet in Germany these areas exist and can be entered for under 10 Euros. Where the food quality/price ratio is so badly skewed that a fiver is likely to provide you with an evening on the toilet rather than a nutritious and filling snack. Only at football can Guinness be advertised at £3.50 per pint, only for the pump to be foregone in favour of a can from the fridge when your money has been taken. Where clubs feel it is necessary to put the words of fan written club anthems up on the big screen , just in case people forget the words. Where clubs are happy to receive positive PR for foregoing shirt sponsorship in order to put a local charity on their shirts. Only then paying over a promised cut of shirt sales to the aforementioned charity when the lack of payment was made public. Where spurious "football rules" are allowed to over rule insolvency law allowing footballers to be paid money they are owed ahead of small local suppliers and the St Johns Ambulance service. Where it is the fans who put their hands in their pockets to donate money to pay debts owed by the clubs to St Johns Ambulance the value of which would barely be a week's wage for one of those players. Where a winding up from Revenue & Customs seemingly poses no real threat to owners who have financially mis-managed their club, living a dream that bore little resemblance to the nightmarish reality. Where at least 28 professional or semi-professional UK football clubs have gained the winding up order badge of honour in the last year and are willing to partake in the ultimate game of brinkmanship with HMRC before pulling a financial rabbit from a hat. A game where the Premier League, the FA and the Football League's' definition of the words "fit and proper" is looser than MC Hammer's trousers. Where a club's fans are enthralled by overseas investment and promises from Thai Duty Free Magnates, Indian Chicken Companies or from serial football owners/administrators Peter Ridsdale / Milan Mandaric. Yet you cannot help but feel it will all end in tears. Where such enormous sums of money are pumped into the game that the need to compete leads owners to gamble not just on short term prizes, but on the long term future of clubs. Where player wage costs increased dramatically in 2010 to 67% of total revenue, in some cases turnover barely covers player wages. Where the media hype English players and the Premier League beyond belief, yet explode in disbelief when it all goes wrong. Where Richard Keys nearly ejaculates on live TV at the thought of being able to smell the tunnel as Arsenal and Chelsea line-up pre-match. Where Andy Gray, desperately trying to maintain his support for Sky's Premier League "product" dismisses the skills of Messi et al (displayed weekly by his employers), by suggesting that the Argentinian wouldn't fancy it on a cold wet night at Stoke. Where Wayne Rooney can sarcastically address the nation following his and England's abject World Cup draw with Algeria. Berating the reaction of fans who had spent thousands of pounds travelling halfway round the world to watch and support the team. “That's what loyal support is,” said Rooney, yet four months later Rooney demonstrated his admirable values and loyalty handing in a transfer request and vowing never to play for Manchester United again. A week later all was well at Manchester United and Rooney had a new deal earning a reported £250,000 per week, not far off ten times the median average annual salary in this country. 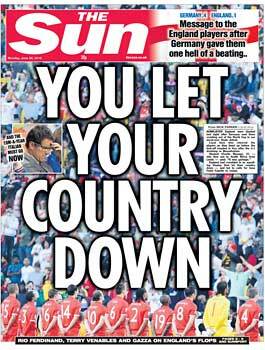 Where a 2018 World Cup bid becomes a not unanticipated waste of £15m. An ineptly run project from start to finish with no leadership, a bizarre choice of potential stadia, scandals and disappointment that Sepp Blatter's push to take football to new frontiers didn't include bringing it home. Maybe the fact that the Chairman of the Premier League and Chairman of Club England distanced himself so far from the bid told you all you need to know about its chances of success. I hope 2011 brings some sanity to the world of football. That some of the harsh financial realities that a large proportion of the country are now facing properly hit home with football clubs and players alike and that the playing field starts to level out. That promoted teams can sensibly establish themselves in the Premier League without taking themselves to the brink to do it. That the authorities clamp down harder and penalise clubs who, in my opinion, cheat by signing players that they know they will not be able to pay the full monthly cost of employing. That is by not paying over the PAYE and NI they have "deducted" from their players salaries. 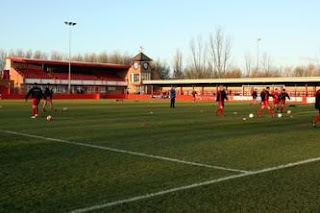 That football's preferential creditor rule is successfully challenged by HMRC leading to a change in the way players contracts are negotiated and that the support line of local clubs, the small businesses that come in and maintain the electrics, fix the burst pipes, paint the stands have as much chance of receiving some form of payment as your star striker. That we see a flattening or reversal of ticket prices so that we don't see empty seats everywhere, so that teams can take a good level of away support to each game and we can get back to having decent banter and a competitive atmosphere at matches. That fans are recognised as the lifeblood of the game, a valued customer, deserving respect and worthy of an opinion. Not a consumer who will just accept what is presented as "the way it is". That fans are able to have their say in the way their clubs are run and that greater opportunity is provided for fans' opinions to be proffered. Most of us are quite intelligent, often more so than some of those making the decisions. Look I know what you are thinking, I said they were hopes, I suspect the reality will be far different. Stuart Roy Clarke's book does not present a footballing utopia, but highlights the little things you have forgotten about that are missing in the sterilised stadia and money-fuelled, media-hyped modern game. If some of the things I hoped for happen, we might get some of those things back. PS If someone can tell me at some point during 2011 what (ahem -Sir) Dave Richards does and how he received his knighthood I would be greatly appreciative. Answers on a postage stamp I am guessing, or a two word comment below, ending in All. A marvellous, heartfelt rant with which it's simply impossible to disagree at all. I am still trying to get my head round Ridsdale and Mandaric taking over at Wednesday and Plymouth. Thanks Lanterne Rouge. Had some similar comments off-blog from others. Great post, Ian. 'The Cradle...' is on my wish-list. It should be on every supporter's list of new year resolutions to learn more about the finances of their club. Unfortunately, most - like Anonymous - are happier just to put their fingers in their ears and carry on 'living the dream'. Excellent post, agree with every word. I grew up supporting Newcastle United, and went through a period in the mid-90s when I didn't miss a single game, home or away, for three years. These days I find it better for the soul to see a non-league team. No new post, so read this!